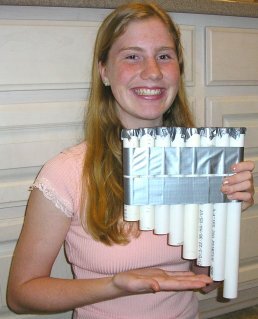 My daughter and I have created a special resource on building and playing Musical Fraction Tubes based on Pythagorean fractions! It includes step-by-step instructions, exact measurements, sheet music, and play-along music tracks. It has everything you need to be successful with your project, from beginning exercises to duets and quartets you can play with your friends. Just like our homemade water bottle xylophone, glockenspiel, melodic tube drums, didgeritubes, and panpipes, our Fraction Tubes are designed to play an 8-note scale in the key of C. By playing these instruments together, you can create an instant homemade instrument band with musical arrangements that work for everyone! Check out all the songs these instruments will play — they're in the table of contents. Phil’s daughter, Sarah, shows you how to make and play a great sounding instrument based on Pythagorean fractions. This 8-note set is tuned to the key of C and can be easily played with your fingertips or a pencil. Sarah shows you how to prepare your materials, and guides you step-by-step in assembling your own set of Musical Fraction Tubes. You will also learn special exercises to develop your playing technique, and some great songs to play by yourself and with your friends. To help you learn faster, Phil and Sarah have included both sheet music and play along tracks for each song. To download this PDF book on "Building and Playing Musical Fraction Tubes" along with all the music tracks, just click the "Buy Now" button below.